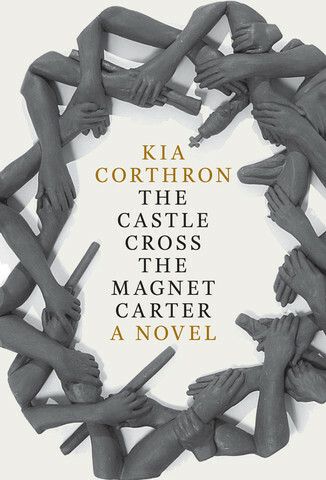 Earlier this month I finished reading Kia Corthron’s magnificent first novel The Castle Cross the Magnet Carter, and I haven’t stopped thinking about it yet. I’ve been dying to talk to someone about it but no one I know has read it yet–it did after all just come out–so I’m going to talk about it a little bit here. On Read Red. Which I herewith declare reborn. The Castle Cross the Magnet Carter is, as any great work of art must be, several things at once. It is a book of amazing craft and innovative technique. The whole first third or so, all of which is written from the POV of four different children, is dazzling. The kind of writing that makes other writers shake our heads in wonder and wonder gee how in the world did she do that. But it’s not the off-putting, fancy-but-unreadable kind of dazzling that in some quarters passes for laudable language manipulation, the kind of trickery for its own sake that accomplishes nothing except displaying the writer’s self-regard. No. This is the pull-you-deep-inside-the-characters’-minds-and-spirits kind of literary magic that so many try but so few can pull off. I don’t know how many times in the weeks since I finished the book I’ve heard little Elliot’s full-of-wonder voice in my head saying ‘I love Mom! I love pork and beans!’ Which might sound like a minor silly example but is not, because these early passages that so thoroughly bring Elliot the young child to life have everything to do with how the reader is engaged with his story as it develops in his adulthood. Well not everything. For the adult Elliot’s story, who he becomes and what he does, speaks to another facet of what this book accomplishes. This is political art of the highest order. As we meet the four main characters–Elliot and his brother Dwight who are Black children growing up in Maryland, and white brothers B.J. and Randall in Alabama–it is 1941. Jim Crow is in full force. The U.S. is about to enter World War II. And we know that these two sets of brothers will come of age at the time of the start of the civil rights movement, and into full adulthood in the 1960s. What we don’t know yet as the novel begins, what I didn’t dare hope even as I was falling in love with it as literature, is that the story will open and deepen and tackle the big stuff. It does. And so as we read on, always engaged in a specific story about specific characters, we also engage with the history of the U.S. in the 20th and 21st centuries. Racism and racist violence. Divisions and solidarity. War. Class. Poverty. LGBTQ oppression. Disability and disabled oppression. Palestine! And more. Anyone who’s ever read any of my posts on this blog during the years I kept it up–or anyone who now reads its title–or anyone who scrolls through and reads some of the archive as I now invite new visitors to do–will know from even my too-brief words here about this book that it meets every criterion for what I consider great literature. It is political art. On the side of the workers and oppressed. Full of passion, wit, charm and heart, this fine novel makes the case, and by doing so flies in the face of the U.S. literary establishment’s anti-political-art rules, for what people’s fiction can truly be. I mentioned heart. Some paragraphs back I wrote that this book is several things at once, and of course I’ve failed to delineate what all those things are yet written too much already, so you’ll just have to discover them all for yourself when you read The Castle Cross the Magnet Carter. But I do want to touch in closing on one facet that absolutely blew me away: the amazing, searing big-heartedness of this beautiful beautiful book. In the closing pages Corthron draws all the threads of the story together satisfyingly and effectively, with grace and skill–but more than that, with an unsentimental depth of emotion that shocked me into the kind of sobbing that makes it hard to read. I won’t say anything specific that would be a spoiler, but I found myself feeling deep compassion for not only the characters I’d grown to love, the characters I could in one way or another identify or empathize with, but also for a character for whom I would never have thought I would or could or would ever want to weep. That Corthron made me cry for this character speaks, I think, not only to her deeply generous humanity, to her powerful insight into human beings, but, most important for a red reader, it speaks to her broad vision of the purpose of literature. She’s making a case for change. For the possibility of change, and the necessity of change. For social change that can and does happen, brought about by people joining together and fighting for it, no matter how hard the sacrifice needed. For the future. And literature’s place in forging it. Hope, then. This is the abiding emotion you’re left with when you close this book. You’re left thinking about how hard it all is, but also how much better it’s become, how far we have to go but also how fully capable we are of moving forward. What a gift.